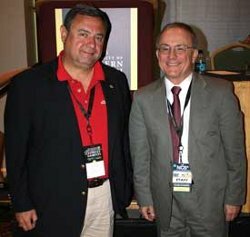 Academy Vice President Dr. T.J. Rosandich (left) met with Dr. Lou Marciani, the Director of the National Center for Spectator Sports Safety and Security (NCS4), during the NCS4’s annual Conference and Exhibition in New Orleans, LA on 3 August 2010. In a post-9/11 world, security has become a primary focus of all aspects of social activity. Sporting events have become potential targets due to their high profile popularity and the number of spectators. Examples abound as evidenced by security costs at the 2010 Winter Olympics were estimated to be $1 billion and at Super Bowl XVIII in Tampa, Fla., 900 federal and local law officers were assigned to secure the event. Security has become a major concern in sports. As a result of these facts, the Academy has added an emphasis in Sports Security to its bachelor’s degree program. In this course, students examine principles and issues in security management as well as the challenges, concepts, strategies, and skills needed to manage security-related operations and activities. Focus is on leadership in management, personnel management, security planning and evaluation, communication, and best practices.